Two relatively new places that couldn’t be more different (and one that is now temporarily closed due to a fire). I’m a bit conflicted posting about Ruffian because it’s a matchbox of a place and I don’t like the idea of someone else taking up my seat but at the same time, it totally deserves the publicity and recognition. 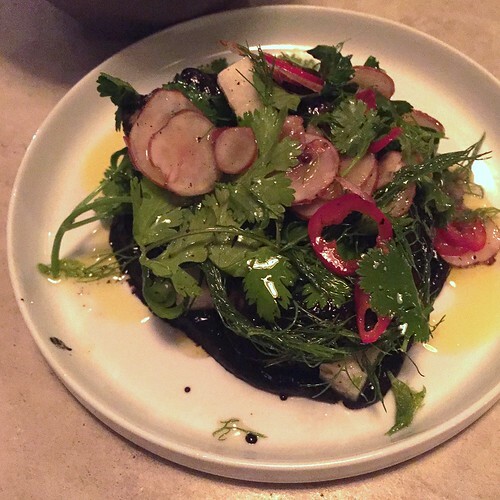 I’ve posted about West Village wine bar, Lelabar, on this blog multiple times and have been a visitor ever since I moved into the neighborhood. One of the first Lela sommeliers I got to know was Patrick – a super friendly guy who’s seriously passionate about his wine, especially anything particularly funky or strange – and when I heard he was opening his own place in the East Village, I knew it’d be a gem. 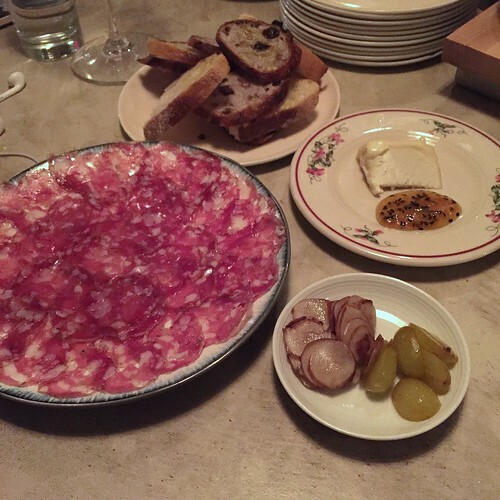 He’s assembled a great team – I know Alexis, the other sommelier, from Lelabar and the chefs, Josh and Andy, are turning out some crazy ambitious Southern French small plates in a kitchen that’s tucked right behind the bar and tinier than mine. One thing to note about Pat and Alexis is that by now, whenever I visit either Lela or Ruffian, I have no idea what I’m drinking since they know my preferences and I always defer to them…it’s an approach that’s never steered me wrong. 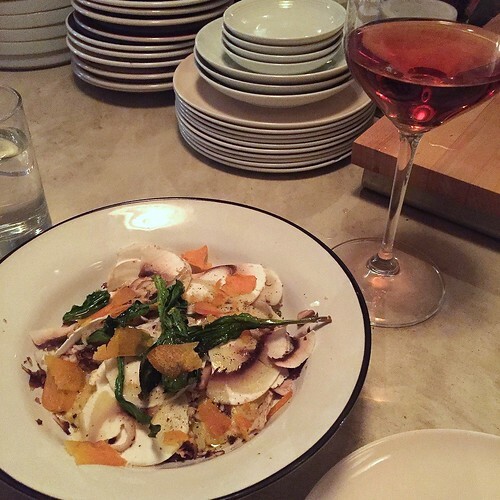 On this visit – Cindy and I started with a refreshing rose wine and this dreamy dish of scrambled eggs with shaved bottarga, ramps and mushrooms. Texture of the eggs was perfectly creamy and I loved the raw earthiness of the mushrooms against the briny, funky bottarga and the garlicky bite of the ramps. Seemingly simple but surprisingly complex. 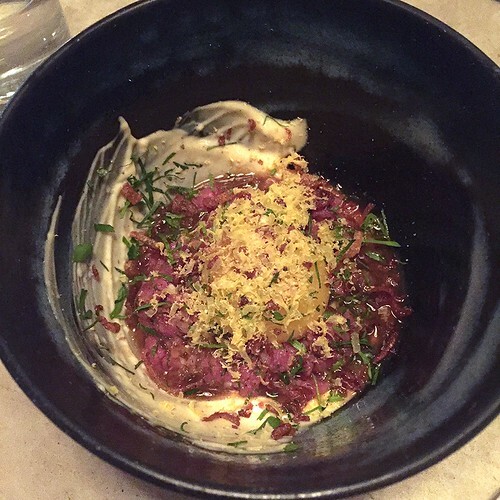 Josh and Andy also had us try this slightly Asian take on a steak tartare – unfortunately I can’t remember what the other components were but I can tell you it was a lighter version compared to classic iterations and so delicious. Here we have the octopus dish with pickled sunchokes, cilantro and a sauce made with octopus ink. The octopus was tender and I quickly became addicted to the sunchokes, which I’d never had pickled and sliced that thinly before. Chilies added some heat and a generous glug of fruity olive oil rounded out the dish. Somehow we managed to eat even more food after all the above – below is some sliced finocchiona, a salami from Tuscany that’s heavy on the fennel, a generous wedge of soft coupole cheese (one of my favorites and not too strong), a selection of crusty bread and then more pickled sunchokes (I’m telling you, I couldn’t get enough) and pickled grapes. We had a really lovely time catching up with Pat and Alexis, meeting Josh and Andy and can’t wait to see what they turn out next. The menu is constantly changing and it’s always a new surprise every time I visit. Much further uptown is April Bloomfield’s newest NYC place, Salvation Burger. Note that the restaurant is temporarily closed due to a kitchen fire they had at the end of May but they should be opening up again soon. If you’re ever in Midtown East and craving some satisfying, greasy food, this is definitely the place to go. We came here right before seeing Fully Committed, a totally hilarious one-man play starring Modern Family’s Jesse Tyler Ferguson about the restaurant industry, and thank god we had enough time before the show to walk some of this off. We split two burgers and a giant side of fries (super crispy on outside, creamy on inside and nicely salted, just how I like them). 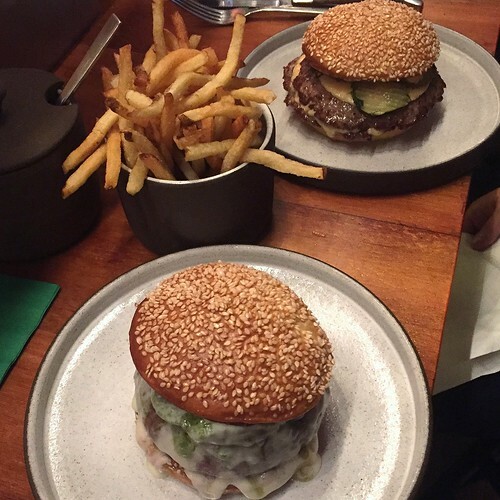 The Classic Burger (second photo below) was basically what you dream a Big Mac could be – a double patty burger with American cheese, some special sauce and pickles – and the Salvation Burger (third photo) had ramp butter, taleggio cheese and a whole mess of mushrooms. Both were cooked to a medium rare, super juicy that I think I used about a dozen napkins, and not too heavy handed with the garnishes, but my favorite of the two was the classic version. It’s a wonder I didn’t start snoozing during the play and I mainly credit Mr. Ferguson’s talent with keeping me awake and entertained. 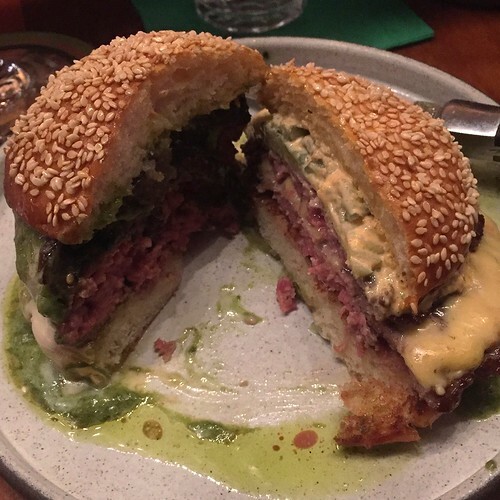 Here’s hoping that Ms. Bloomfield’s team will be able to get the kitchen running again soon…there are admittedly a ton of burger joints in NYC but this one is turning out some seriously good food and the neighborhood needs an upbeat restaurant like this. 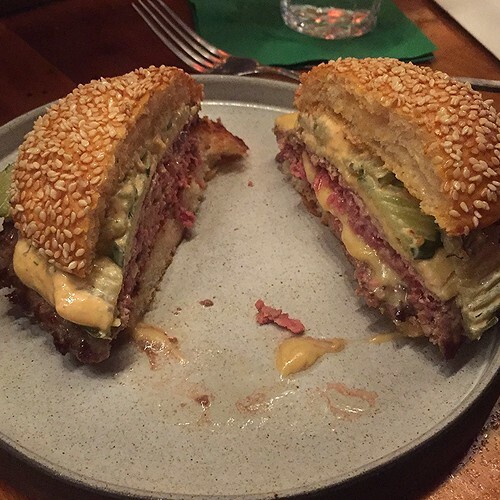 You are currently reading Ruffian & Salvation Burger at Notes on Food.